I co-presented this poster with my colleague, Metadata Librarian Sibyl Schaefer, on March 20, 2010 at the Spring Meeting of the New England Archivists in Amherst, MA. I designed the poster and was responsible for the collection development, publicity, and collection highlights sections. Katz, Robin M. and Sibyl Schaefer. 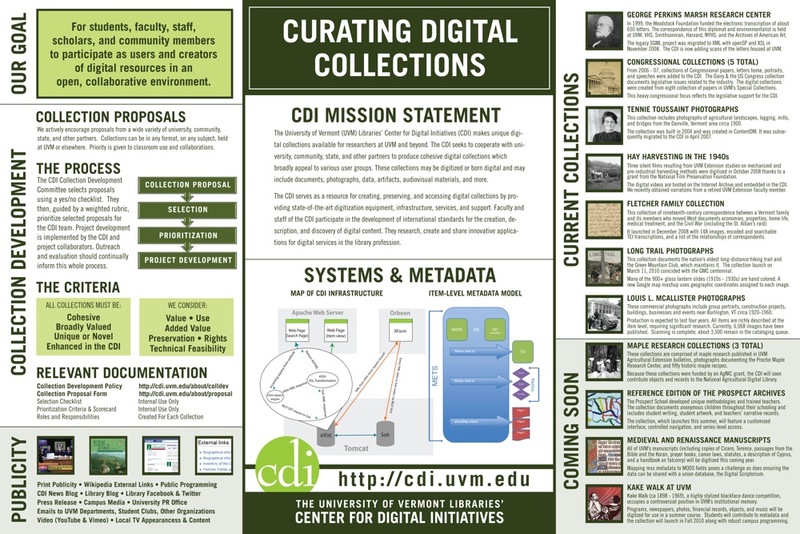 “Curating Digital Collections: UVM Libraries’ Center for Digital Initiatives.” New England Archivists (NEA) Spring Meeting. Amherst, MA. March 19 – 20, 2010. Poster.